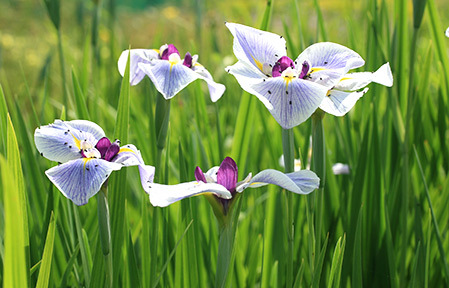 Otherwise known as Japanese Irises, Iris ensata’s flower between June – August. They are the most beautiful and elegant of all Irises in our opinion, they display flowers with short standards but wide falls, giving them a butterfly appearance when flowering en masse. Unlike their bearded cousins they thrive in rich moist soil full of nutrients, they grow well on the edge of a pond or in a moisture rich border. They are heavy feeders and benefit from plentiful watering in April and May to encourage flowering. Usually reaching 100cm in height.